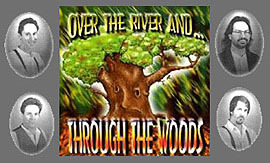 Although they have elements of rock and roll, "Through the Woods" aren't your average rock band. How many bands can write about postal shootings ("Valerie"), true old-west legends ("Chang and Eng's America"), dating in prison ("The Darker Side of the Street") and the fall of Superman ("Crutches") in one single album? They are one of the most visual bands I've heard, and I mean that truly in a sonic sense. I just wanna see what these guys can do in the video format! E.C. : First, I love the band's bio on your web page! I couldn't stop laughing. The band's history almost reads like a vaudeville "Spinal Tap". Are the basic facts in the bio true? Stuart: It's unfortunate that we've been labelled a "vaudeville band" by some local press in Los Angeles. The saddest part is that they meant it as a compliment! In fact, we did a gig with Harry Shearer...errr...Derek Smalls once, at Luna Park. He was playing bass for his wife that night- it turns out we both collect horrible records (Mrs. Miller, Leonard Nimoy, Wink Martindale- you get the idea) . Yeah, that's pretty much our lives up to two years ago. We were voted Band of the Year by the National Academy of Songwriters and to celebrate, we took some time off to feel sorry for ourselves- anyone who's lived in Los Angeles long enough knows you just can't find the time for self pity- so I went through the "who am I" and "what's the point" stuff, and worked up enough self hatred to give some back to the world. We spent eight years in L.A. and heard the same thing from every record company in town- "We LOVE you guys! It's fresh, fun, it really excites me to see something like you guys on the local scene!" Do you want to sign us then? "Oh, no, we couldn't do that! We don't know how to market you! There's nothing to compare it to that's making any money!" Well then, what should we do to become more marketable? "OH, DON'T CHANGE A THING! WE LOVE YOU GUYS!" Bob still has the map that finally brought us to L.A.- though I swear it said "Hell" when he bought it. E.C. : You've produced children's records and done work on a kid's TV show. It seems to me that it would assist in conveying a simplicity and in getting your messages across in your songs. Do you think this helps you in writing songs for "Through the Woods"? What kind of kids TV show was it? Will TTW's ever perform live on it, in kind of a "Pee Wee's Playhouse" kind of thing? That's a good question about conveying messages in songs- the whole idea behind Through the Woods is like a musical Grimm Fairy Tales- the songs are usually about society's outcasts- circus folk, serial killers, shut ins, and we even hand out lyric booklets at shows that have woodcut pictures that pertain to each song. The songs are stories, just not the kind you normally tell your kids. Strangely enough, I got the jobs BECAUSE of Through the Woods- somehow these different people thought this guy who writes about freaks, murder and death could tweep out some kiddie fare! E.C. : Speaking of your name, the bio mentions that "Over the river and through the woods to Grandmother's house we go" was the original name. But your bio didn't say what image or message you were trying to put across with your name. Any hints? Stuart: It just sounded so homey, cozy and warm, like any dysfunctional home tucked away in snowy glens. But when you look under the covers, grannie's gone and a wolf is licking his chops! It always struck me how trivial death is portrayed in children's stories and rhymes, like "Rockabye Baby", so it became a focus for the band- conveying uncomfortable subject matter with a sense of humor- though it's not always funny. Some tracks are about friends and family, and those tend to get serious. I worry about the people I surround myself with- no wonder I'm a shut in by nature! E.C. : Other than the diversity of your music, my main attraction to TTW is your humor! Some might call it "twisted" or "warped". But, I loved the song "Valerie" even before I paid attention to the lyrics and discovered that it was about a shooting at a post office. What are your influences, humor wise? Are there any topics that are "off limits" as the subject matter of your songs? Stuart: Nothing is really off limits, but the closer to personal something becomes, the less humorous it gets. The band has flatly turned down several songs because of content- that's when I know there's an envelope to respect. In a song on the cd called "Trouble", there's a lyric that goes "In my dreams it seems I'm never wearing pants" and that seemed to upset Bob at first. But he had no problems with "Wax Paper", which is about love accesories sitting in the pantry. Go figure! I guess lyrically the biggest influences would be bands like Sparks, They Might Be Giants, Robyn Hitchcock, Tom Waits- artists that took a left field view of left field topics. One of my favorites sources for material or insights is the World Weekly News- simply indespensible reading! Jerry Springer's show is also a wealth of emotional input. E.C. : I hear influences of the Beach Boys, Phil Spector, XTC and the Alan Parson's Project. Do you consider TTW's a "rock band"? Stuart: I guess you have to decide on those bands first- Spector and Wilson are HUGE influences on me- almost every track on the cd is saturated with vocals and Wrecking Crew noises. You'd have to toss the Flaming Lips, Ray Davies and Tom Waits into the mix too- their best stuff is simply untouchable. We rock as hard as you can when you're using hubcaps, cocktail drums, bicycle wheels, and assorted homemade wooden things. We were known as "The Soundman's Nightmare". We were also described as "Pop Music After the Blast", when people strum whatever shards they can find during the nuclear winter. One song on the cd, "Waterline", features 40 voices, as well as my homemade hurdy gurdy and the earlalaika- it's a three string balalaika I put two more strings on and then made a sitar bridge for- plinky, yet twangy-plangy! E.C. : With such a lush, Phil Spector influenced sound, how does the music translate live on stage? Does translating your songs live present any special problems? Do you guys do a lot of live gigs? Stuart: In the past, the songs were WAY more acoustic, since there were only four or five of us. The cd is the apex of what each song could sound like if you had the state of Utah backing you up. But we figured that why not? Develop each song to it's fullest on record, and then you have a completely different experience listening to the band live. Actually, live the band rocks pretty good- it's more guitar oriented, as well as making use of silence in different songs- playing of dynamics alot. We fill up some of the space with events- we've had tap dancers for songs, held All Polka nights, we've had "Neilson Nights", where we'd play all new songs and hand out questionaires. We also had a seance for Elvis at the Troubador on His birthday- we had the crowd chant "Clambake! Clambake! Girl Crazy! Girl Crazy!" over and over while a single spotlight focussed on a peanutbutter and banana sandwich. We didn't find him, but when the spotlight suddenly went out and the houselights came up, the sandwich was gone! We're just getting back in the saddle after a two year hiatus- we had a never ending member-go-round which finally discouraged us and I fell into a dark place for a long time. Fans and friends would write or call, and kept pushing me to get out of my head- I've had friends that got to that dark place and didn't return, and they were making more and more sense. Finally, I picked up my different instruments one day, just to strum, and every song was right there waiting- like time stood still, and it had an impact on me, and I started recutting the band demos, adding, remixing, and suddenly different offers were coming from odd places- soundtracks, label interest, all the things the band needed way back when. So now, we're regrouping for the record, and pondering on what to do next. But yeah, we played a ton in Los Angeles for seven years, always to intrigued but terrified A&R people. E.C. : My favorite line of your lyrics is from "Chang & Eng's America": "Life's a free admission, when you're on exhibition." That song reminds me of the Beach Boys, "Heroes & Villains", with its 19th century Americana theme. Was that an influence? Stuart: Wilson is a major influence on me, and I hadn't noticed the H&V similarity until I finished the recent additions to the track, but yeah! It breaks into different parts ( with others in the can unused) . Stephen Foster was also an influence. I'm about halfway through writing a musical based on Chang & Eng's life, with a Foster style soundtrack (this song isn't part of that). Unfortunately, someone beat me to the punch with a musical based on girl siamese twins that BOMBED on Broadway- lousy music didn't help it any. So until people forget that, C&E will exist in this song alone. E.C. : In your bio it states that you were a UFO abductee, is that true? I grew up in Seguin, Texas, which was the national headquarters of MUFON. Can we expect a song about UFO abductee's? E.C. : I had a question about the packaging of your upcoming CD. You sent me an advance and I know that the song selections and such are still being finalized? I love the packaging, it is very visual-will the final release be similar? Stuart: The first 500 cds will be packaged in the original fold out cd cover, plus it will have the original enhanced cd of demos that we sent out to radio stations two years ago, along with the new 17 track cd. Such a deal! We're working on a slimmed down (read that: CHEAPER) version of the cover now, with similar graphics, but less tuck and fold time. That one will just have the new cd. E.C. : Once the CD is released, will a tour of some sort commence? Stuart: There will be different forms of promoting it, though I'm focussing on the internet first. We'll set up a live internet performance, and make local appearances in the radio markets that support the record the most. These days, it's pointless for a band to endlessly tour, unless there's big money behind you- and even then, they take it back from cd sales. We're also debating on whether to make it a bigger band to reflect the Larger sound of the cd. Our biggest markets when we sent out the demo cd to college radio was Florida, Wisconsin, New York and Minnesota, so we may look at those markets to start with. E.C. : I know that you got A LOT of great feedback from the demoes that you sent to various radio stations. Has there been any major label interest? Stuart: When we sent out the cd, we hired a guy to push it, who figured he could get us some airplay on maybe 100 college stations- we sent out to more than 400, which I was against at the time. As it turned out, we were Getting played on over 400 stations within 6 weeks, which shocked us. There has been some label interest so far, mainly from the rough mixes we have up on mp3.com/ttw , but I'll be honest- as wonderful as a big money push would be (and unlikely), I don't see what a big label can offer the artist anymore that the artist can't get through the internet. Maybe promotion, but that's it. I'm recording and mastering the album on our own money, so there's no fat to trim- I could see a joint venture, maybe, but why have other opinions involved where they shouldn't be? ALOT of artists these days are turning down the big companies, since the money they almost demand to be spent on a record are hardly ever recoupable. In our case, the cost is zero. E.C. : Finally, it seems that a band with such imagery and humor in their songs would make the next logical transition to videos. It that in the cards for "Through the Woods"? Stuart: We're working up some ideas now. Probably do some lo-fi videos ala Sparklehorse. Actually, I was approached by a choreographer who wanted to put a dance troupe together and use our stuff. I'd love to see people doing Bob Fosse to "The Last Word Spoken By The Human Race".